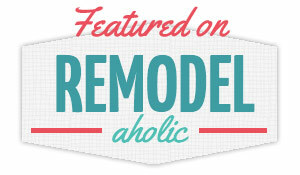 If you've followed this blog for a while, you know we take pride in saving money. We hardly ever buy anything at full price. If you come to our house, we'll beam with pride as we tell you which pieces of our furniture and decor came from thrift stores and garage sales. We buy appliances and electronics from the as-is section without blinking an eye. We just love a good deal. Some ways to save money are obvious, while others a little more crafty. I thought I'd list off some of our best cost-saving methods here on the blog because I like nothing more than helping others save a buck. Because you know what's better than saving money? Helping someone else save money too so that you have someone to high-five about it! Saving money requires hustle. Let's take the main way we save money, doing DIY projects. Does it take longer and require more effort for us to do things ourselves, like when my husband saved us thousands by installing the backyard turf himself? Absolutely. But sometimes it's worth it. And you know those extreme couponers we hear about? They have my utmost respect. That takes serious dedication and hustle to run down those grocery bargains. We've been huge fans of the Southwest Airlines credit card for a long, long time. We put as many of our living costs on this credit card every month and watch our Rapid Rewards grow and grow. Our pot of gold at the end of the rainbow was a Companion Pass, which allows one person to fly for free when the other person is flying. Unfortunately we finally earned it right before I went on bed rest with the twins. UGH! But even still, we were able to use it for 4 free flights during the twins' first year of life. The key to that strategy is that you want to be able to pay off your credit card balance each month or you might find yourself in credit card debt. If you can comfortably pay off your monthly expenses before being charged interest each month, consider putting them all on a credit card with rewards to earn some extra value while you spend. This is something my husband does every so often, and it fascinates me every single time. He calls our cable/phone provider as soon as they raise our rate and negotiates it back down to the promotional rate, which is always a savings of at least $30 per month. He will literally stay on the phone with them for more than an hour because you know how hard they make it. That's where the hustle factor comes in. I would probably give up and just pay more, but not him. And he always, always wins. If you're not getting your provider to budge, mention that you've researched their competitor's prices and you're more than willing to switch. That usually gets their attention! When you're talking about a standing monthly fee like internet, phone, cable, etc., that money saved really adds up. Remember when I said we love to buy from thrift stores, Craigslist and garage sales? We do! We have scored some major, major bargains that make our house look like a million bucks. A recent favorite? This Restoration Hardware chandelier cost us $400 on Craigslist (which is admittedly really steep for a Craigslist purchase by our normal standards), but it retails for more than $1,100 on RH's website and it is the crown jewel of our patio. I LOVE IT SO, SO MUCH. Hooray, Craigslist! Our rule of thumb when buying secondhand is that we want it to be at least 50% off retail price. Exceptions might be made if it's a one of a kind vintage item, but for things like the West Elm office chair we bought two weeks ago, we Googled it first to make sure we were getting it for at least half price even though it was practically brand new in box. If somebody is selling an Ikea dresser for $150 that sells for $200 new in the store, we're passing. Not only do we buy a lot of things on Craigslist and Facebook, but we make a point to recoup costs by selling stuff whenever we can. And when I say "we," I mean Scott. He is so good at this! He started purging things a couple months ago - a car seat here, an old iPhone there, my dusty elliptical - and not only have we gotten rid of tons of clutter, but we are $1,000+ richer than when he started back in January. That's literally $1,000 we wouldn't have if he wasn't willing to randomly meet people in parking lots and spend a few minutes posting our stuff in the Facebook marketplace. One of his favorite things to do is buy stuff on Craigslist or Facebook for really cheap, use it for a little while and then sell it for either the same price or even more than he paid originally. He's done this many, many times with tools and electronics. He'll see something better pop up on Craigslist, and he'll quickly sell his old tool for a profit before going to buy the new one. He's like a Craigslist ninja. Not interested in the Craigslist life? Perhaps you're a single woman who isn't too keen on meeting strangers to make the exchange. You can try some other selling tactics, such as selling your gently used clothes (Plato's Closet, Clothes Mentor, Kid 2 Kid, Once Upon a Child). I do this a lot for our entire family's clothing and then I donate the rest. Or you can do it the old fashioned way by having a garage sale. This is pretty commonplace, but it often pays to bundle services from the same company to negotiate a better rate. Not only does this work well with cable, internet and phone providers (not to mention car/home/life insurance), but you can try it for household services, such as "sharing" a lawn maintenance service with your neighbors so they only have to come to your neighborhood once to do 2-4 lawns in one stop. It really pays to do your due diligence before you make a big purchase, especially if you know exactly what you need. The internet is an amazing tool for comparing prices on any item under the sun. We'll spend days or weeks researching an item before we purchase. Not only do we compare prices, but we read reviews and study the features very hard to make sure we're getting the best value out of whatever product we're planning to buy. Side note: Those daily sale sights we love so much (I personally look at Zulily almost every day before bed) do not always have the best prices. If you put something in your cart on a flash sale site, google it before you make the purchase. Sometimes the actual manufacturer is selling it for that exact same price on its own website in the clearance section. Make sure your "flash sale" is really a good discount before you buy it! Did you know there are many companies who will match their competitors' prices even if they don't advertise it? We've had success price matching at big hardware stores, electronics stores and even stores that specialize in baby gear. Most of the time we just look up the Amazon price on our phone, and if it's cheaper than what we're about to pay in store, we just show them the Amazon price and they'll match it. The main requirements are that it must be the exact same model number and it must include the shipping cost. We really don't buy anything without searching for price comparison first, even when shopping in person. Your phone is always a resource. Just tonight, we were standing at Target about to buy a wagon for the twins when we looked up the same wagon on Amazon and noticed it was more affordable there. That little bit of knowledge saved us $30-$40, and when I got in the car I bought it from Amazon. We are not fans of having a lot of different credit cards for rewards (we only have Southwest) but we do participate in loyalty programs. In fact, I just earned $10 from DSW today because of some recent purchases. If the loyalty program is free and you shop there a lot, what do you have to lose? Never buy anything at Hobby Lobby or Costco without their customary 40% off a single item coupon. In fact, never buy anything from anywhere without Googling it first to see if it has a coupon! This is especially true for online purchases. All it takes is entering the "[store name] discount" into your search bar to see if you can get a percentage off or even just free shipping. That extra 30 seconds is well worth it. My husband has a couple of his own rules when it comes to finding skilled labor for the right price that have served him well so far. When possible, he tries to find skilled professionals (roofers, contractors, plumbers, etc) that are not employed by big companies. He looks for small companies or even one-man shops that don't have the overhead of a big company because that is often reflected in the prices. He judges a company by its website - if it's too nice, he keeps looking! That may not work for everyone, but that's one factor in his decision. And he always takes the extra time to get more than one price for every project just to be 100% certain that he's getting a fair deal. If you are willing to contribute to the labor of the project - the grunt work or demolition, for example - you can offer to work with the professionals to get a bigger discount. Not only do you save money, but you usually learn new skills while you help them out. He did this with our huge patio cover project. He hired a professional framer and roofer - individuals, not companies - and worked alongside them during the entire project, helping with whatever he could while they did the highly specialized work. If you're doing a big home project, consider buying your own materials to make sure you're not paying a middle man to track them down. Buy your own shingles for a roofing project. Buy your own paint even if you've hired painters. That way they can't mark up the cost of materials and you ensure you're only paying for the labor. One thing I want to add is that I do believe time is money, so with each of these options you have to weigh the value of your time spent versus the money saved. Sometimes it simply isn't worth it. As you can see, we aren't extreme couponers. I tried couponing for groceries and toiletries once, and I was really bad at it. You have to play to your strengths. Rest assured that we are not rich folk - he's a teacher, and I work at a nonprofit - so every little dollar saved helps. I was raised to celebrate saving money and shopping the sale rack, and I get a little adrenaline rush every time we score a great deal. 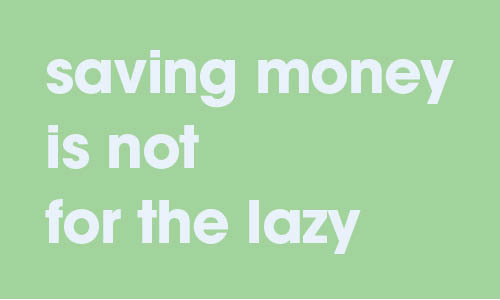 Now that we've shared our tips for saving money, what are yours? Do you have anything to add to the list? I'm always looking for new ways to pinch pennies!